The world's only "consulting criminal." James Moriarty is attired in one of his designer suits. 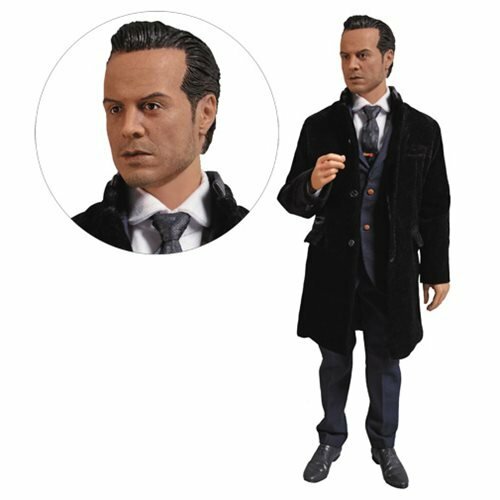 11-inch figure boasts interchangeable hands and an excellent likeness of actor Andrew Scott. Accessories include a tea cup and saucer, a smart phone, a pistol, a multitool knife, and more! James "Jim" Moriarty is the world's only "consulting criminal," a stark contrast to the occupation of his nemesis, Sherlock Holmes. From the BBC's Sherlock series by Steven Moffat and Mark Gatiss, this 11-inch tall figure features a fully realized likeness of actor Andrew Scott as the captivating villain. Attired in one of his designer suits and with an arsenal of accessories, this is the figure for your Sherlock collection! The Sherlock TV Series Jim Moriarty 1:6 Scale Action Figure includes a tailored suit jacket, trousers, a shirt with a round collar, a tie with a printed pattern, a medium-length overcoat, a pair of gentleman's shoes and partial sock tubes, a tea cup and saucer, a smart phone, a pistol with removable magazine, an "IOU" apple and multitool knife, 8 interchangeable hands, and a display stand.